Our work at Caesarea focused largely on archaeological excavation, but we studied elements of landscape and architectural design as well--and this aspect of our work is important as we try to understand Caesarea as not only an ancient site, but also an example of political power and a meeting place of Eastern and Western design. Students excavated the site scientifically and then explored the palace through graphic reconstruction and interpretation. Some of that work is included here in a gallery (larger images, longer download times). 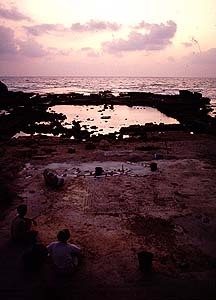 Please be our guest and use this site to explore the archaeological excavations of The University of Pennsylvania Museum and the Hebrew University of Jerusalem in Herod's palace at Caesarea Maritima, on Israel's Mediterranean coast.